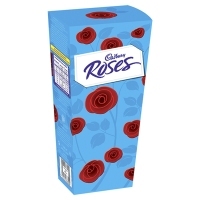 Cadbury Roses are a selection of individually wrapped chocolates currently made by Cadbury. Introduced in 1938, they are named after the English packaging equipment company “Rose Brothers” (later Rose Forgrove), that manufactured and supplied the machines that wrapped the chocolates. Roses are inexpensive chocolates, containing a small proportion of cocoa solids, and a high proportion of vegetable fat. A large packet can be bought cheaply, making them a common stand-by gift choice due to the variety of contained chocolates. They are an extremely common gift on Mother’s Day and sell well throughout the Christmas period. They are available in tins, boxes, or jars, and in the United Kingdom and Ireland currently contain 10 different varieties of chocolate.